NASA's Hubble Space Telescope snapped this portrait of Mars within minutes of the planet's closest approach to Earth in nearly 60,000 years. This image was made from a series of exposures taken between 5:35 a.m. and 6:20 a.m. EDT Aug. 27 with Hubble's Wide Field and Planetary Camera 2. In this picture, the red planet is 34,647,420 miles (55,757,930 km) from Earth. Olympus Mons [the oval-shaped feature just above center] is the size of Arizona and three times higher than Mount Everest. The dormant volcano resides in a region called the Tharsis Bulge, which is about the size of the U.S. and home to several extinct volcanoes. The three Tharsis Montes volcanoes are lined up just below Olympus Mons. Faint clouds are hovering over Arsia Mons, the southernmost of these volcanoes. The long, dark scar, below and to the right of the Tharsis Bulge, is Valles Marineris, a 2,480-mile (4,000-km) system of canyons. Just below Valles Marineris is Solis Lacus, also known as the "Eye of Mars." The dark features to the left of Solis Lacus are the southern highlands, called Terra Sirenum, a region riddled with impact craters. The diameters of these craters range from 31 to 124 miles (50 to 200 km). The image was taken during the middle of summer in the Southern Hemisphere. During this season the Sun shines continuously on the southern polar ice cap, causing the cap to shrink in size [bottom of image]. The orange streaks are indications of dust activity over the polar cap. The cap is made of carbon dioxide ice and water ice, but only carbon dioxide ice is seen in this image. The water ice is buried beneath the carbon dioxide ice. It will only be revealed when the cap recedes even more over the next two months. By contrast, the Northern Hemisphere is in the midst of winter. A wave of clouds covers the northern polar ice cap and the surrounding region [top of image]. This view of Mars reveals a striking contrast between the Northern and Southern hemispheres. The Northern Hemisphere is home to volcanoes that may have been active about 1 billion years ago. These volcanoes resurfaced the north's landscape, perhaps filling in many impact craters. The Southern Hemisphere is pockmarked with ancient impact craters, which appear dark because many are filled with coarser sand-sized particles. 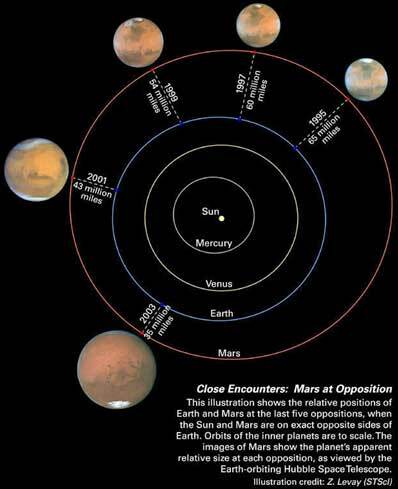 Mars and Earth make a "close encounter" about every 26 months. These periodic encounters are due to the differences in the two planets' orbits. Earth goes around the Sun twice as fast as Mars, lapping the red planet about every two years. Both planets have elliptical orbits, so their close encounters are not always at the same distance. 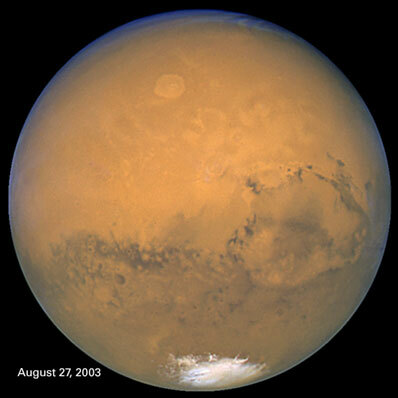 In its close encounter with Earth in 2001, for example, Mars was about 9 million miles farther away. Because Mars was much closer during this year's rendezvous, the planet will appeared 23 percent larger in the sky. Mars will not be this close again until 2287. This photograph is a color composite generated from observations taken with blue, green, and red filters. A total of 11 filters, spanning a wide wavelength range -- from blue to near infrared -- were used during the observations. The shorter wavelengths show clouds and other atmospheric changes. The longer wavelengths, including the near infrared, reveal Martian surface features.